Owen is a little monkey, and like all little monkeys, he likes climbing things! 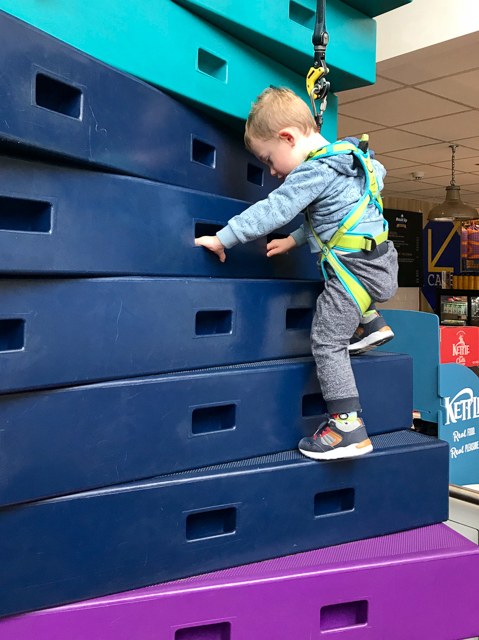 I had looked at taking him to the Ballroom Climbing Wall in Coventry, where I occasionally go climbing, but they don’t really cater for toddlers. Then I learned about “Clip ‘n Climb“, which was suitable for Owen as they use a safety rope. Rock Up in Birmingham is our local one, and they run toddler sessions on some weekday mornings – including Friday, my day off! Perfect! As expected, Owen was really excited about going climbing and enjoyed driving through Birmingham, especially looking at all the cranes and seeing a 911 GT3 in the car park. We got Owen rigged up in his harness easily enough and attached to the rope on the first wall. Owen seemed to get the hang of it fairly quickly, getting up to about my head height, with a bit of help from the staff. However, he didn’t like the idea of jumping off, even just to see how the safety system worked. I guess it must have felt a bit unnatural to him. At this point he got it into his head that he didn’t want to climb the wall again and as anyone with a toddler knows, once they have decided something there is no changing their mind! Next we moved on to a ladder – at home Owen loves climbing ladders, but again after reaching roughly my head height on his first try he gave up and didn’t want to go again. We then moved on to the wall in the photo at the top of this post. He did really well on this one, coordinating his arms and legs to climb up to the overhang. He then needed some help to traverse across to where he is in the photo, where he climbed a bit more, once again up to about my head height. By this point I think he’d had enough of climbing, so we moved from the walls to a circle of posts, which increased in height. Once connected to the safety system Owen was able to clamber on to the first post, looking pleased with himself. However the jump to subsequent posts was too far, so he needed help to jump between them. Fortunately the safety rope took most of his weight, so I was able to lift Owen until he was standing on a post taller than me! I think at this point Owen realised just how high up he was and he took a bit of coaxing to jump down into my arms. At this point we decided to move to the soft play – when taking a toddler to an activity it is good to have a backup option included in the price. And all toddlers seem to love soft play! Especially in Owen’s case, when there are toy trucks to play with. Owen happily spent the rest of the session playing with trucks, jumping in the ball pit and running around, up and down the soft play. When it came to leave Owen had his only tantrum of the morning, screaming that he “wanted to stay here forever”! Even though the climbing aspect didn’t go as well as I had hoped we’ll definitely be going back to Rock Up for their toddler session. At £6 (including three hours free parking) I thought it was good value for money and an ideal wet weather activity! The staff were great with Owen and most importantly he absolutely loved it! The Ballroom Climbing Wall opened in the centre of Coventry last month and I had been following the build up to the opening on their Facebook page. Although I have never climbed before, I wanted to give it a go, as it is such a good facility to have in Coventry. I also thought it would be good cross training for mountain biking – I’ve noticed that some top pros, like Rachel Atherton and Aaron Gwin include climbing in their training. I went for one of their group introduction sessions, as I am a total beginner. I was with in a group two young kids and half expected them to pick it up really quickly and embarrass me, fortunately being a bit taller and having decent upper body strength helped. Our instructor Frances did well in balancing the different needs of the group, explaining the flow of the routes and how to visualise them before climbing. This was important as I moved up from the very basic routes (only to the next level, 1 on a 0 to 9 scale with 9 being the hardest). I wasn’t expecting the thinking element, I thought climbing would be all about strength and flexibility. I also underestimated just how much of a work out it would be! My arms were really starting to ache after an hour, I could have stayed for longer, but was conscious that I needed to leave something in the tank to cycle home. The type of climbing is called bouldering, it is a simple form of climbing as there are no ropes! The top of the wall is only 4.5m high and the floor is a big crash mat, so falling isn’t a problem. Falling properly was one of the first things we were taught, as well as not to stand behind/under people climbing, as they could fall at any moment. Not all of the routes went up either, there are a couple of horizontal routes, which took me a bit for thinking to fathom out. Each route probably only took me a few minutes, but my body felt like it was much longer, it is a pretty intense workout! I’ll certainly be going back to The Ballroom, as I think climbing will be a good addition to my training, which is currently mostly cycling, with the occasional swim. As The Ballroom is open until 22:00 during the week, and indoors, it will be particularly good in the winter, when it is too dark and muddy to get out on the mountain bike. It also seems to be a social sport, so I will be trying to get some of my friends to join me there.